Moishe had a wife named Gitel, who nagged him mercilessly. From morning until night, she was always complaining about something. The only time he got any relief was when he was out buying and selling junk and scrap metal with his old mule. One day, when Moishe was negotiating a deal, his Gitel brought him lunch. 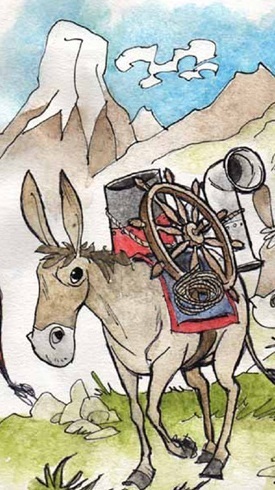 Moishe drove the mule into the shade, sat down and began to eat. Immediately after saying his broches (blessings), she began nagging him again. Complain, gripe, nag, nag; it never stopped. Suddenly, the old mule lashed smack in the back of the head, killing her dead on the spot. At the funeral, the Rabbi noticed something rather odd. When a female mourner approached Moishe, he would listen, then nod his head in agreement; but when a male mourner approached him, he would listen, then shake his head in disagreement. This was so consistent, the Rabbi decided to ask him about it. After the funeral, the Rabbi asked his old and dear friend why he nodded his head in agreement with all the women, but always shook his head in disagreement with the men. “And the men?” the Rabbi asked.